Riyadh: Imagine someone recording your conversation while you are on phone or someone tracking your monetary transactions without your consent. That’s the new world of mobile phone hacking for you. According to data security solutions providers, many use their mobiles to store information such as passport numbers, which drastically increases the ‘haul’ for a cybercriminal who successfully attacks the device. In a report, ‘Mobile Malware Evolution 2018’, released on Tuesday, Kaspersky Lab researchers have seen the number of attacks using malicious mobile software nearly double in just a year. In 2018, there were 116.5 million attacks as against 66.4 million in 2017. Despite more devices being attacked, the number of malware files has decreased, leading researchers to conclude that the quality of mobile malware has become more impactful and precise. As the world is becoming more mobile, the role of smartphones in businesses and day-to-day life is growing rapidly. Against this backdrop, cybercriminals are paying more attention to how they are distributing malware and how attack vectors are used. The channels through which malware is delivered to users is a key part of the success of a malicious campaign today, taking advantage of users who do not have any security solutions installed on their phones. The success of the distribution strategies is demonstrated by not only the increase in attacks but also the number of unique users encountered by malware. In 2018, the encounters figure rose to 9.89 lakh from the previous year’s 7.74 lakh. Among the threats encountered, the most significant growth was in the use of Trojan-Droppers, whose share almost doubled from 8.63% to 17.21%. This type of malware is designed to bypass system protection and deliver all sorts of malware, from banking Trojans to ransomware. “In 2018, mobile users faced what could have been the fiercest cybercriminal onslaught ever seen. Over the course of the year, we observed mobile device infection techniques such as DNS hijacking, along with an increased focus on enhanced distribution schemes — SMS spam. This trend demonstrates the growing need for mobile security solutions to be installed on smartphones to protect users from device infection attempts, regardless of the source,” said Viсtor Chebyshev, a security expert at Kaspersky Lab. 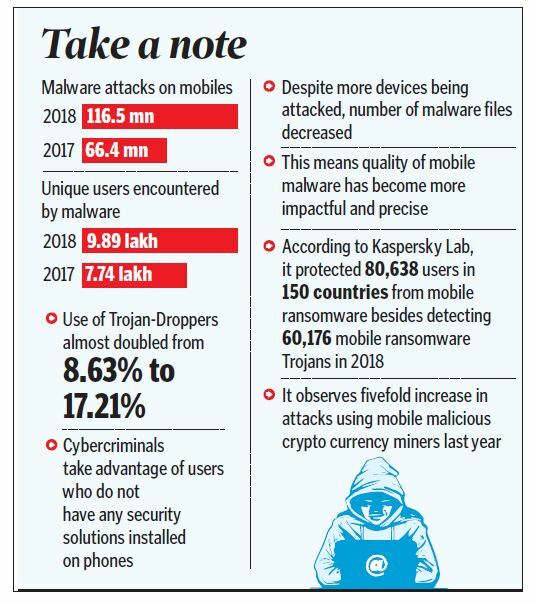 The report also said in 2018, Kaspersky Lab products protected 80,638 users in 150 countries from mobile ransomware, with 60,176 mobile ransomware Trojans samples being detected. It added that a fivefold increase in attacks using mobile malicious cryptocurrency miners was observed last year. It also revealed that 1,51,359 installation packages for mobile banking Trojans were detected in 2018, which is 1.6 times more compared to previous year’s figures.